Come celebrate the holiday season at Sneaky Dee’s! As always, Dee’s has got you covered, all of you nacho lovers who can’t make it to see the family (or don’t want to), can come celebrate an early Christmas with us! 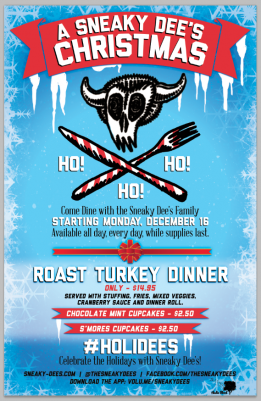 On Monday, December 16th, Sneaky Dee’s will be serving up all of your holiday favourites, all day long! With everything from turkey dinner to delicious holiday cupcakes, you’ll definitely be wanting seconds. Did we mention that it’s affordable… a full Roast Turkey Dinner for only $14.95. Don’t forget, you can always get your loved ones some special Sneaky Dee’s gifts as well, including gift cards online, Hot Sauce, clothing and more, check out the shop for more deals! So come hang out for a special Christmas dinner at Sneaky Dee’s! Ugly Christmas sweaters welcome for #Holidees!